(CNN) -- On Sunday, nearly three weeks after her daughter went missing, Laura Calderwood learned that a woman's body had been found in rural Iowa. But soon, word came: Authorities didn't think it was Mollie Tibbetts, Calderwood's 20-year-old daughter who disappeared on July 18. Calderwood was saddened at the thought the woman was someone else's daughter. "My thoughts are with the family," she said. And so, the wait continues. Mollie's family believes she is still alive. The last time anyone saw her, she was out for a jog in the small community of Brooklyn, Iowa, just east of Des Moines. Since then, investigators have fielded hundreds of tips. 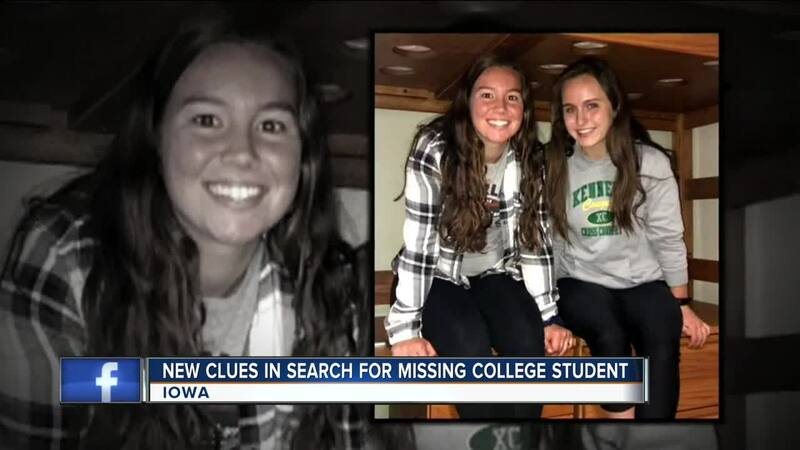 But the University of Iowa student is still missing. The days since Mollie disappeared have been chaotic, Calderwood said. She tries to begin each day with some structure, to help maintain a sense of normalcy for her two sons. She makes breakfast for Jake, a 21-year-old University of Iowa student, and Scott, a 17-year-old high school senior. But the rest of her day has little to no structure. Her phone lights up with about 30 to 40 phone calls and text messages a day -- from the FBI and state authorities, from friends and family, from the media. "It's a lot of talking on the phone," she said. She said she has found peace in moments she can control, taking walks and swimming laps in a local pool. The calm of those moments helps her "keep some balance" when everything seems like it's falling apart. That, and the people around her. "What's keeping me strong is the outpouring of friends and family who call to offer their support, from people in the community, people in the state, to friends across the country," Calderwood said. A reward fund grew by nearly $100,000 since last week, ballooning to $260,000 by Sunday, according to Greg Willey at Crime Stoppers of Central Iowa. Family members, volunteers and others focus on their duties: getting the word out about Mollie's disappearance and keeping her story in the news while authorities focus on the investigation, said Mollie's father, Rob Tibbetts. "They are extremely motivated. Most of the men and women working on this have daughters Mollie's age," he said. "That is encouraging." Mollie's father, two brothers and others spend hours driving from town to town distributing flyers at concerts, baseball tournaments -- wherever there are crowds. "We're all operating on about four to five hours of sleep, if that," he said. Investigators are searching for Tibbetts in ponds, fields and from the air, authorities have said. Kevin Winker, director of investigative operations for the Iowa Department of Public Safety, acknowledged last week that the case was "frustrating." "Unfortunately, we have not yet found Mollie, but it has not been due to a lack of effort or a lack of resources," Winker said Friday. In her quiet moments, Calderwood takes comfort in remembering good times with Mollie. "I just think about silly things," Calderwood said. A favorite memory is when they made gingerbread houses around Christmastime in San Francisco years ago when they lived in Oakland. Calderwood's gingerbread rendition was neat and tidy -- like Martha Stewart herself had made it. Her daughter's version was "kind of, like, chaotic," she said, laughing as she remembered it. "Two different takes on the gingerbread," she said. She said her mind has drifted to her daughter's performances in plays ever since she was in the sixth grade. Mollie's makeup and costume transformed her into whatever character she was playing, Calderwood said. She was "fearless out on the stage," Calderwood said. And Mollie, a child psychology major, was just as outgoing off-stage, her mother said. Rob Tibbetts said last week that the quiet moments he spends away from family and supporters are hardest for him. "When you're alone, you talk to Mollie, and then you know why we're fighting," he said. "She's out there. We just feel it." Obviously, everyone has their moments, but they keep it to themselves, Tibbetts said. "The focus is on getting Mollie back." Calderwood said she, too, talks to her daughter daily. Sometimes she brings up one of Mollie's favorite songs when she hears it. She tells her to come home, she said. "We need you here, Mollie."